In this article we are presenting complete details about exam pattern and selection process for SBI Special Management Executives (Banking). 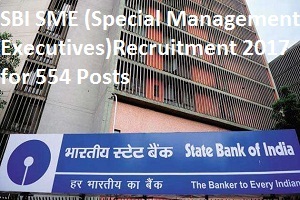 State Bank of India declared notification to recruit Special Management Executives (SME) (Banking) for 554 vacancies. The tentative date of Online- examination is 18th June 2017. The SME (Banking) will be recruited in two grades viz: MMGS III and MMGS II. The eligibility criteria and exam pattern is different for the grades. An emolument is high for MMGS III. For MMGS III Grade: CA / ICWA / ACS / MBA (Finance) or equivalent post graduation degree in Finance. For MMGS II Grade: CA / ICWA / ACS / MBA (Finance) or equivalent post graduation degree in Finance. Leased accommodation at place of posting or within Circle. Concessional Interest Rates for Housing/ Car/ Personal Loans. What is Smart Compensation Package (SCP) in SBI? In last year, SBI announced that it plans to offer, subject to necessary approvals, a SMART Compensation Package which would give employees the choice to monetize specific elements of the salary package. Probation period for both the posts will be 1 year from date of joining. After completion of probation period successfully, the officers will be confirmed in respective grades and will be governed by extant specialist cadre placement and promotion policy. The officers can opt for conversion to General Cadre after completion of five years including probation period. In case of conversion to General Cadre, the seniority of the officers in specialist cadre will be protected for all future promotion. Selection Procedure: Candidates will be selected through online objective test, group exercise and/or interview. Note: Candidates are required to qualify in each of the objective tests by securing minimum passing marks, which will be decided by the bank. Group Exercise and / or Interview (50 marks): The marks of objective test of the qualified candidates will be arranged in descending order of merit and candidate’s maximum three times of the number of vacancies in each category will be called for group exercise and/ or interview. The qualifying marks in group exercise and/ or Interview will be as decided by the bank. The candidates will have to qualify both in Online Test and GE & Interview separately. Marks secured by the candidates in the Online Examination will be normalized to out of 75 and marks secured in Group Exercise and / or Interview (out of 50 marks) will be normalized to out of 25. The final merit list will be arrived at after aggregating normalized marks of Online Examination and Group Exercise & Interview. The selection will be made from the top merit ranked candidates in each category. SBI offers best in class benefits to its employees. Start preparation to become a part of India’s most valued company.